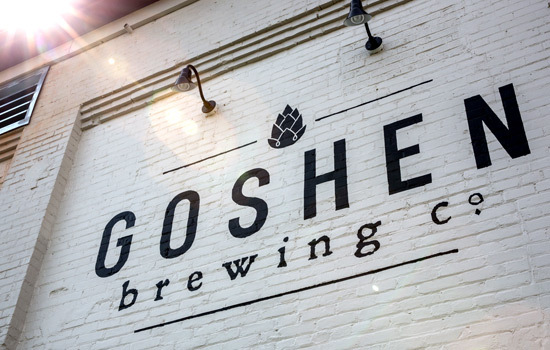 Goshen Brewing Company is a family-friendly brewpub serving a wide selection of beers and seasonal, local, farm-to-table food. We are a 100% wind-powered facility! We recycled the former Northern Indiana Public Service Company (NIPSCO) building to provide a comfortable, industrial space to eat, drink, and socialize. At GBCo. 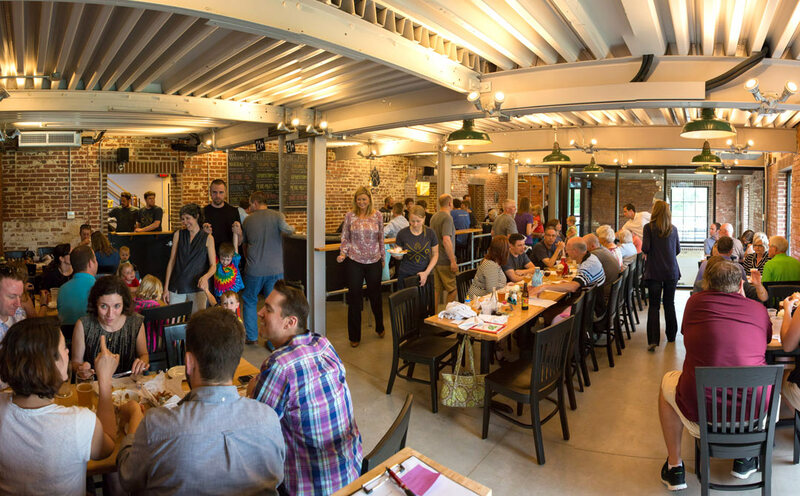 we believe in the power of community, so we offer big, open tables where you can sit and get to know your neighbors. Located two blocks off of Main Street, we are close to downtown and feature a patio that overlooks the woods and the river, with easy access from the Millrace bike path. 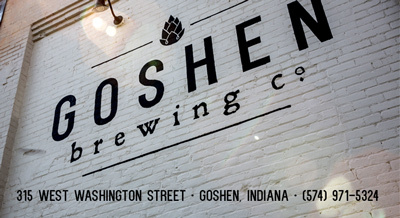 Jesse and Amanda Sensenig are the founders of Goshen Brewing Company. 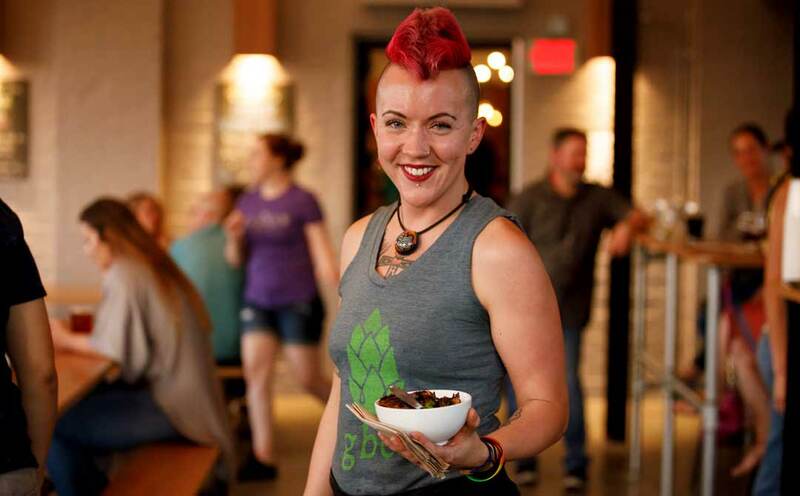 Their passion for beer, food and community was developed while living in Charleston, SC, and then in Fort Collins, CO. At the time, Fort Collins was home to the most breweries per capita in the U.S., and as responsible citizens they checked them all out. 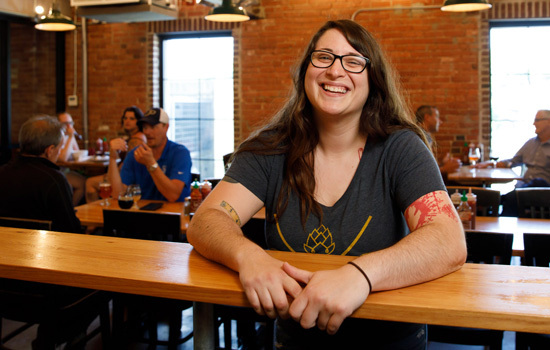 Inspired by the quality and the range of beer styles available, Jesse began brewing and meticulously developing recipes. 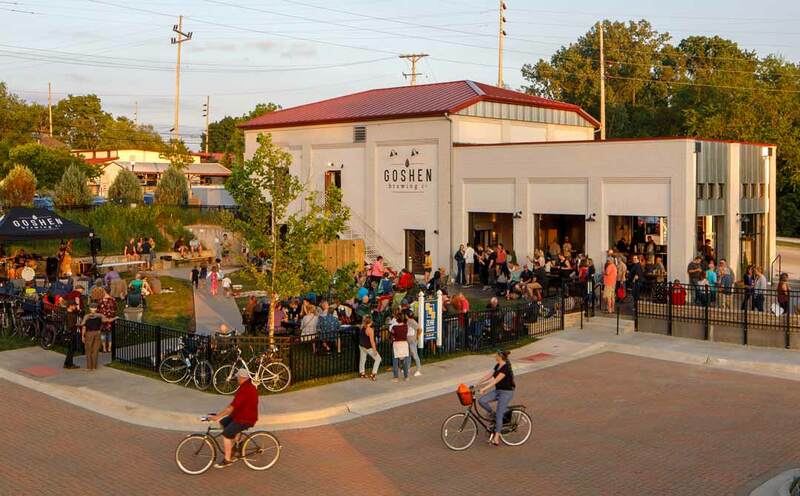 Because Amanda is a Goshen native, and both are Goshen College graduates, Goshen seemed like the perfect place to carry out their vision. 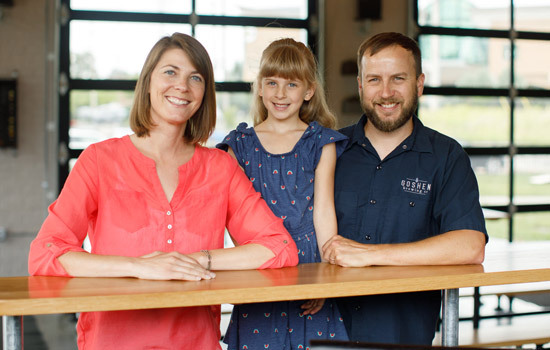 They are excited to run a brewery that maintains the values of quality, freshness, integrity, and passion that so many other businesses seem to live by in the surrounding community. In addition to brewing, Amanda and Jesse spend their free time cooking, hiking, camping, listening to music, biking, and spending time with their families. 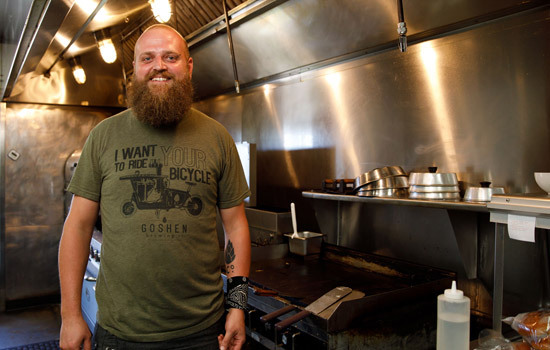 Local chef Jesse Shoemaker heads the culinary team. Jesse has lived in Goshen most of his life, and graduated from Goshen College. He lived in New Mexico and Chicago for a while before moving back to the Maple City, and developed a passion for creating things from scratch while working in a variety of restaurants. 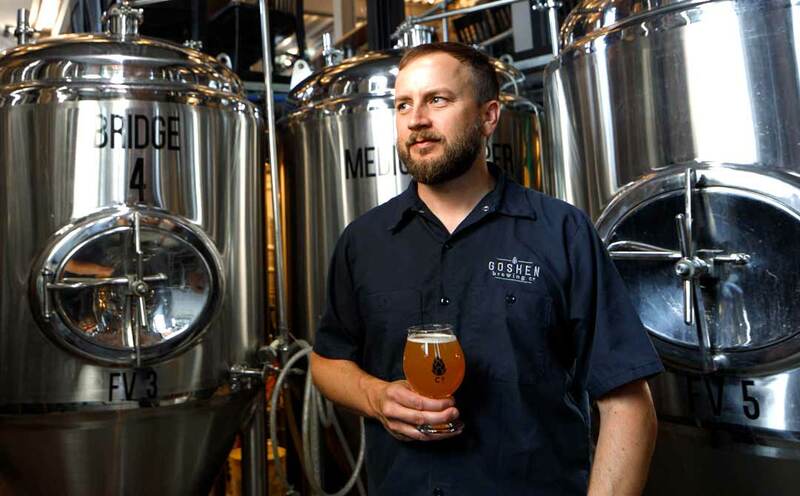 He previously worked at Venturi and Constant Spring in Goshen before starting with Goshen Brewing Co. In his spare time Jesse likes working and building with his hands. 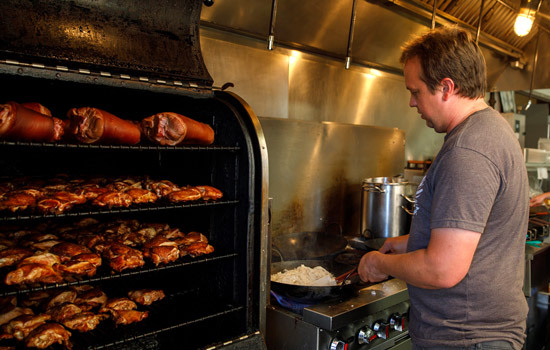 Justin Ramer works as sous chef, overseeing many aspects of the kitchen. He graduated from Bethany Christian High school and attended Hesston College in Kansas. Justin has had fun honing his kitchen skills in a variety of settings, including Constant Spring and Venturi in Goshen. 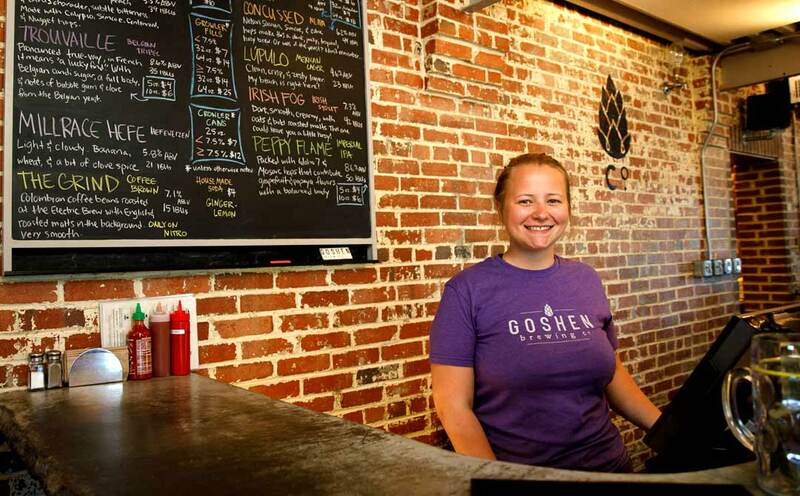 He appreciates the vibrant downtown scene Goshen offers and is passionate about good local food. 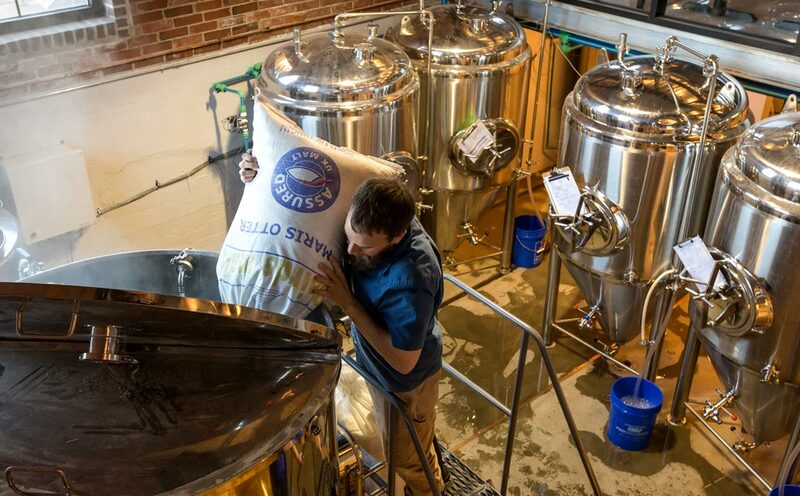 In his free time Justin likes visiting new breweries and trying new beer, sports, camping, outdoor activities, and spending time with his nephews. 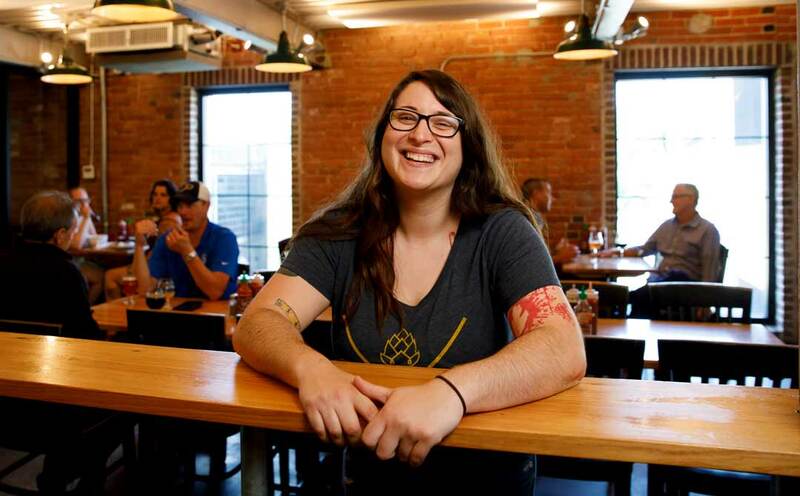 Michigan native Jamie Lyn Morrow regulates all over the Taproom and the Beer Hall as the Front of House Manager. She originally came to Goshen by way of an art internship after graduating from Northern Michigan University with a Bachelors of Fine Arts in Ceramics. Jamie has been with GBCo. since opening day and continues to love being a part of the brewery family. Even though ceramics brought her here, it’s clear that beer makes her stick around! In her spare time, Jamie enjoys doing one new thing a week, going to concerts of all kinds, pizza, hanging out with her naked cat Ogre, singing in the car, and dirty jokes. All photography on the site is by Grant Beachy and Stuart Meade Photography.